Bob Riker tried to assess his chances in the Tigers system to the Central Michigan University paper Life in July 1990. The newly minted professional ball player saw some immediate impediments to his career, but he also saw himself eventually moving up. "In the whole Tiger system, the pitching staffs are doing pretty well. I'll just have to come back here next spring and show them what I can do," Riker told Life. "If I didn't think I could make it in the big leagues, I wouldn't even be trying." Riker never did make the bigs, or move up. Riker played that single season and didn't play another. His career in baseball continued, however. He soon returned to his old high school, Brother Rice High School in Michigan as a coach, eventually making head coach. He continues with Brother Rice in 2016. He's also made the Michigan High School Baseball Coaches Association Hall of Fame. 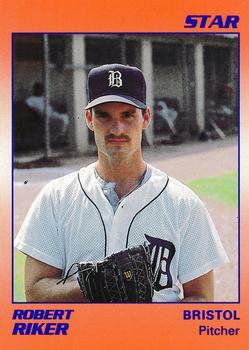 Riker's professional career began and ended that year in 1990, taken by the Tigers in the 39th round of the draft out of Central Michigan. Riker is also credited by his formal name, Robert Riker. Riker played his only season at rookie Bristol. He got into 19 games, starting five. He went 2-5, with a 6.12 ERA, marking the extent of his career. By 1991, Riker was back at Brother Rice as an assistant coach, helping the team to a state championship in 1992. Riker made head coach in 1998. He's since taken his school to two state championship games, winning in 2008. In his first 15 years, Riker posted a 392-156 career record, according to the school. In 2016, he made the state coaches Hall of Fame. "This is really for all the players that have played for me and the coaches that have worked for me," Riker told The Detroit Free Press of the honor. "Two things have gone into this; I've had great players who have worked hard and brought along the other players, and I've had great coaches."